Sounion - with its majestically placed Sanctuary of Poseidon temple perched above the bay - is often the last anchorage on the mainland of Greece, before diving into the Cyclades, either reaching for Kea island or Kythnos island. This beautiful spot is also easily combined with sailing holidays in the Saronic, Argolic or the Hydra Gulf - distances here are much shorter than in the Cyclades. The temple of Poseidon was erected in 440 BCE, and on top of a former (likely demolished) temple dating from the earlier Archaic Period. The design of this temple is a typical hexastyle which explains the front portico (porch like entrance) with 6 columns. 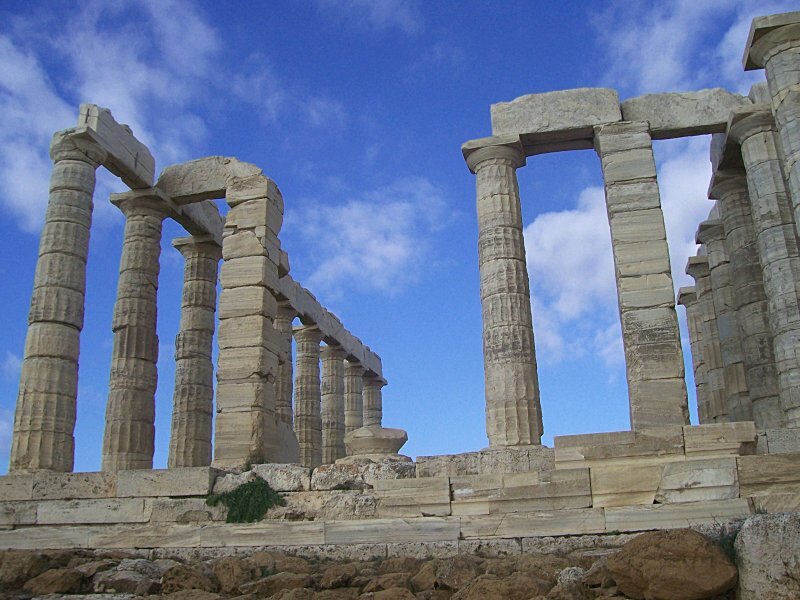 Today only 18 Doric columns of the Sounion temple remain upright, but intact it would well have had great similarity with the contemporary and beautifully preserved Temple of Hephaestus on the Acropolis, and these two temples might well have been designed by the same architect. Temples like these make yacht charters in Greece so special, and many see a sailing holiday out of Athens into the archaeological rich Argolic gulf, Saronic gulf and the northern Cyclades are the place to explore the origins of dawn of civilisation. Most yacht charters from Athens (Alimos marina and Kalamaki) also aim for Ios, Syros and Amorgos, despite the distances involved, these are usually 2-week or 3-week itineraries, ideal for sailing in Greece.